The Veterinary Health Center (VHC) at the University of Missouri’s College of Veterinary Medicine is pioneering a new approach to treat one type of canine megaesophagus, a devastating disease of dogs. 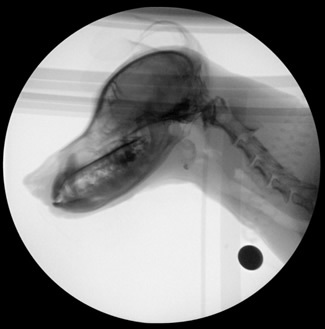 This image shows a canine patient during a video fluoroscopic swallow study. These studies, performed by members of a collaborative research project at the University of Missouri, were a major component of revolutionary techniques developed for the diagnosis and treatment of megaesophagus, a devastating disease of dogs. A partnership between the VHC’s Small Animal Internal Medicine, Radiology, Surgery, and Nutrition services and an investigator in the Otolaryngology-Head and Neck Surgery department at the university’s School of Medicine has resulted in the discovery of a breakthrough treatment for a subpopulation of dogs with megaesophagus. The Mizzou team has identified a defect of the lower esophageal sphincter (LES) as a potential treatable cause of megaesophagus. Megaesophagus (ME) refers to a large, dilated esophagus with poor or no motility preventing normal passage of food and liquid into the stomach. With ingesta not reaching the stomach to produce the sensation of being full, the dog will continue to eat. As a result, the esophagus enlarges greatly. Dogs end up not getting enough calories so they waste away. Dogs with ME also regurgitate large amounts of undigested food and some of that material can be inhaled into the lungs. This inhalation can result in aspiration pneumonia, a dangerous additional symptom that kills many affected animals. The LES acts as a valve between the esophagus and the stomach, opening when food and water are swallowed, then clamping tight so food doesn’t come back from the stomach into the esophagus. In dogs afflicted with megaesophagus caused by an achalasia-like syndrome, the LES remains closed. In order to receive a better diagnostic result, the Mizzou collaborative research team blended innovation with adaptation, developing new techniques and tools while borrowing procedures from human medical practices to diagnose and treat this type of canine ME. Assistant Professor Teresa Lever, MS, PhD, from the Otolaryngology-Head and Neck Surgery department, spearheaded the development of trapezoidal holding chambers or kennels — which are now patented — where dogs walk in and are funneled to the narrow end of the enclosure. The animals are more naturally restrained and are given food that they consume while standing upright. Lever’s lab, in cooperation with an independent company that conducts feeding trials in dogs, also developed a number of different recipes and consistencies of food and liquid to optimize how well the dogs could take it down and discover which contrast agent was more palatable and effective. “So, now we have these chambers, we have optimized palatable recipes, and we have experience in normal, healthy dogs without swallowing disorders, as well as lots and lots of patients coming in with other swallowing disorders,” Reinero said. “It was in the process of developing this protocol and having clinical patients come in when we recognized that LES-achalasia-like syndrome was the underlying cause of megaesophagus in some dogs. That’s when we began to adapt what they do with humans, a therapy where we’re opening or dilating the LES with Botox and/or balloon dilation. “We perform an endoscopy to first dilate the LES and then administer Botox, which paralyzes the sphincter muscles that formerly wanted to remain closed. While we are still evaluating this procedure, we’ve had dogs with remarkable clinical improvement. Additionally, when we repeat the fluoroscopic studies, we can document an open LES. The patients that show improvement can be candidates for surgery, and that surgery is potentially curative,” Reinero said. During a patient’s recovery, residents in the Nutrition Service monitor the dog’s weight and food intake. The amount of food an owner may give a pet might need to be altered every couple of days. James Schachtel, Bvet Med, MRCVS, is a Radiology resident and key collaborator in the study. “This approach gives these dogs a chance, whereas a lot of them didn’t have much of one,” Schachtel said. “At this time, it is early in the evaluation process, but it’s a novel approach that shows promise. “This subpopulation can receive a really significant benefit from our direct ability to detect their malady. It can give them a really good quality of life. This is a revolutionary diagnostic technique for a disorder identified with a pathological outcome. It offers us the opportunity to use therapies that have been successful in people, so we’re optimistic we can experience similar success with canines,” Schachtel said. Schachtel will present an oral abstract of the swallowing protocol and early identification of the LES achalasia on Oct. 20 at the American College of Veterinary Radiation Annual Scientific Conference in Orlando. The Missouri team encourages veterinarians, pet owners and breeders to contact the VHC for information about the new diagnostic and treatment. To have a pet evaluated, contact the Small Animal Hospital at 573-882-7821.